A 35-year old female patient in her early puerperium presented with subacute confusional state and benign intracranial hypertension syndrome. Computed tomography (CT) scan of the head showed sulcal effacement and an empty delta sign without parenchymal lesions. 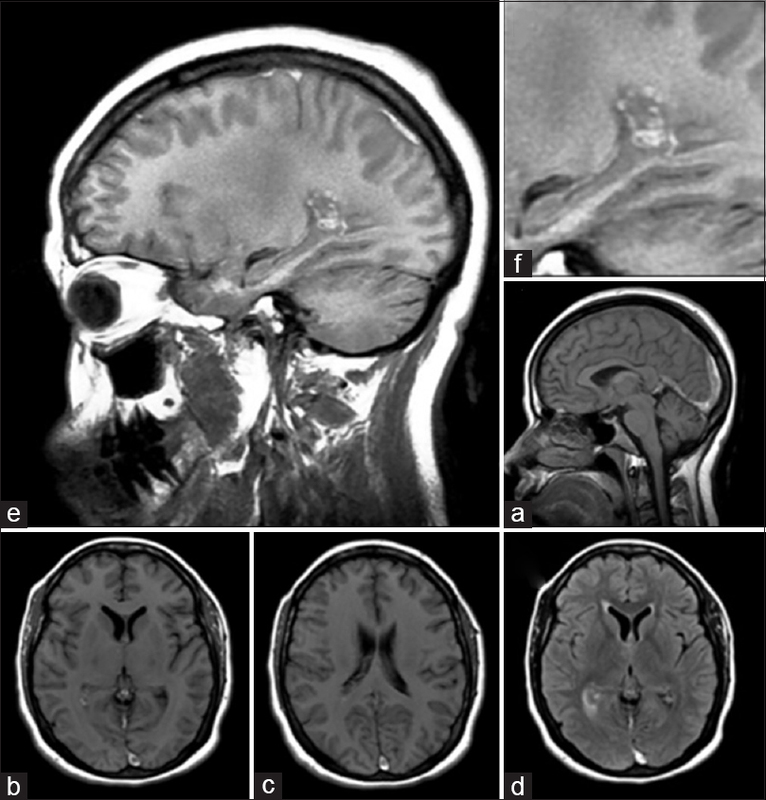 The conventional magnetic resonance imaging (MRI) demonstrated cerebral venous thrombosis (CVT) of the superficial and deep venous systems, along with an abnormal finding at the right ventricular trigone suggestive of intraventricular choroidal venous thrombosis [Figure 1]a,[Figure 1]b,[Figure 1]c,[Figure 1]d,[Figure 1]e,[Figure 1]f. On MR angiography and venography, there was no evidence of tangles of blood vessels, flow voids signals, or hemosiderin compatible with brain arteriovenous malformation. The patient was placed on anticoagulants and discharged after 10 days later with a mild persisting headache. We consider that the involvement of the intraventricular veins was due to the widespread deep venous system thrombosis. CVT is an uncommon cause of stroke with varied clinical presentations, predisposing factors, and image findings. Etiological factors can be acquired or genetic. Pregnancy and puerperium are predisposing factors for CVT, and most events occur during the third trimester and 6 weeks after delivery., Here, we describe an uncommon radiological presentation of CVT which could also be considered with the wide spectrum of imaging findings of this entity. Kamel H, Navi BB, Sriram N, Hovsepian DA, Devereux RB, Elkind MS. Risk of a thrombotic event after the 6-week ostpartum period. N Engl J Med 2014;370:1307-15. Dash D, Prasad K, Joseph L. Cerebral venous thrombosis: An Indian perspective. Neurol India 2015;63:318.